October 21, 2015 is the day chosen by Marty McFly and Dr Emmett "Doc" Brown to time travel forward to in the 1989 movie Back to the Future 11. The movie featured many speculations about the world in 2015. Some such as flying cars and Jaws 19 have failed to eventuate but some technologies, including handless and wireless video games and multi screens are here. Some surprising inclusions such as drones walking dogs are being tested. For an in depth review of the status of their predictions go to the BBC website. 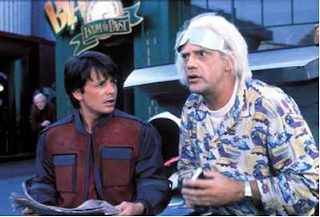 You can find out more about the day and the movie on the Back to the FutureDay website and face book page.